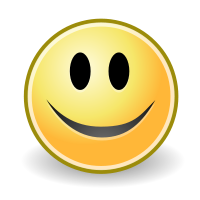 THE ICON SMILEY IS A POPULAR SYMBOL OF HAPPINESS. The purpose of business is to make profits... NO! THE NEW TRUTH?! : The purpose of BUSINESS IS MAKING PEOPLE HAPPY! Profits will follow, like a faithful dog!! Sounds a little odd, however, with the present trend of most markets becoming buyer or prescriber markets, business has verily become a happiness management system. To make customers (external & internal) happy is not an easily defined process. Happiness is a relative state of mind. The concepts of happiness change from time to time in the same person, and happiness means differently to each individual. For the same person, what delivered happiness now may not do so after a few days, because his threshold of happiness has got elevated! Hence, happiness is called a fuzzy concept (ie., unfixed). There are endless sources of happiness - from the intangible to tangible. Most of times we associate only tangible items as sources of happiness, such as money or material gifts - no doubt, these are are very vital sources of happiness to MRs, field personnel, office employees, doctors, stockists and retailers. However, there are also other intangible sources of happiness too. The pleasant, attractive and fragrant presence of a MR in a dull and tense clinic or hospital environment, is a source of happiness to the staff and doctors alike. When this same MR, has good conversational skills and a knack to appreciate, the MR becomes a highly acclaimed resource of happiness for the doctor. To appreciate a person, is not easy, it requires a good deal of homework about the prospect or customer, and appreciating accurately. Many a times, a doctor is looking for a confidante to share his thoughts and experiences, the trustworthy MR often fills this void in a doctor's life. Business experts and scientists have done deep studies on the science of happiness. Serotonin a brain chemical (neurotransmitter) is the well established 'chemical of happiness'. One of the ways to ensure serotonin boosts, is by engaging the Maslow's Hierarchy of Needs - this not only boosts happiness, we see a happiness economy in action! Business practitioners suggest using happiness as a framework for organizational activities. Need for happiness is at the root of a consumer's purchase behaviour. Hence, business @ happiness is a pertinent concept!! Martin Seligman - is a psychologist and American author who has worked for decades in the field of happiness or positive psychology, as he calls it. He has several insights for obtaining happiness. For instance, magenta is his favourite colour for its amazing effect to calm humans. The PERMA based technique for employee and doctor engagement is a useful approach rather than concentrating only on material inputs for engaging doctors. When a field manager, during joint field work, provides timely and good beverages and food at good joints, to the MR, the work becomes a pleasure. This is a simple and affordable input but it goes a long way to establish foundations for good organizational operational working. Many doctors are driven and highly energetic. This is because they find their vocation highly absorbing and provides them with a feeling of accomplishment. Taking a leaf from this analogy, when an organization, offers a melange of absorbing activities to MRs and field personnel, with a potential for generating accomplishments, the employees become more engaged. Accomplishments need to be celebrated at proper platforms in form of organizational events. A promotion, achieving a sales target, making a record turnover, obtaining certifications ... celebrating such events, will empower and engage employees, and provide with higher involvement and confidence. An employee is eternally looking for PERMA based experiences, a doctor or customer also has PERMA based needs that will provide him with happiness. Hence, PERMA is an interesting approach for strategising. Training modules with interactive activites that are PERMA based will create fabulous training outcomes. Not only will employees be engaged in activities, they will have take-home messages and experiences that will improve productivity. All in all, today, pharma business is not a simple production and marketing activity, it is becoming a well thought out process of generating happiness to internal and external customers. Pharma business is about offering pleasures to prescribers (egs. : appreciation, samples, small gifts and sponsorships), it is about engaging them in thoughtful and relevant in-clinic activities, it is also about having sound ethical relationships, it is also about partnering with doctors in creating meaningful experiences (and reiterating products); and finally, pharma marketing is about being a partner in each doctor's accomplishments. A contemporary pharma company has a PERMA approach to happiness management of doctors and retailers; as well as internal customers. A permanent solution for high employee turnover in the Indian pharma industry is the 'perma approach' which is holistic and not a one-way street. Thanks for reading this blogpost, please recommend this blog to your acquaintances, and do read all other blogposts, by clicking on olderposts as and when required.